I'm a bit of a Humble Indie Bundle junkie for one reason or another. As long as I'm interested in a few of the games in the bundle, I'm pretty likely to dive right into things. Plus those addictive bundles come with soundtracks for some of the games, which make for rather fun listening at times. 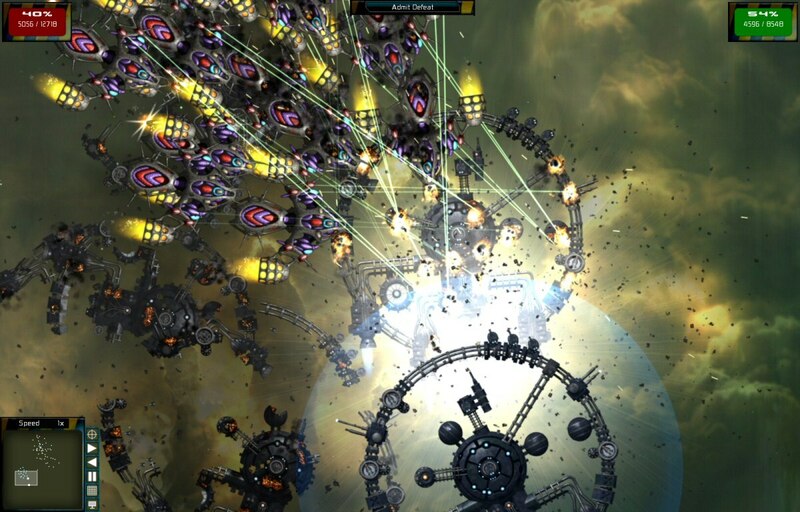 I had picked up Gratuitous Space Battles as part of the Humble Indie Bundle 6, along with a number of other interesting games. But I sort of forgot about it at the time since I didn't have a gaming-capable computer at the time. So I finally found the time to play the game recently and was rather surprised at how things turned out. Gratuitous Space Battles is a space warfare game that also features some innovative design elements. It was developed by Positech Games for PC, Mac and Linux, but of course I've only played the PC version of the game. You can either look at this as a strategy game or a tower defense game, depending on how you approach things. The game concept is simple enough - you are put in control of one side in a space conflict and you'll try to do your best to survive the enemy armada. But the way that you'll accomplish this is actually outside the battle itself. You start with three pre-made ship designs provided by the game but from there you're free to create your own ship designs using the parts that you have available to you. Once you're happy with your designs, you'll be given a limited amount of credits and pilots to determine the limits of your fleet. Sometimes stages have special limitations such as shields no longer working or conditions being such that fighter-class ships aren't safe. Thus you'll find yourself creating new ship designs or customizing existing ones to meet the new victory conditions. All this leads up the actual battles themselves...which you largely watch. Given all your pre-battle planning in terms of designing your ships, determining how each ship will behave (e.g. Ship A will prioritize enemy frigates instead of cruisers) and then you just watch how they cut through the battlefield. The whole time you'll be told who is leading the battle in terms of remaining fleet strength until things reach a point when victory for one side or the other is inevitable. The battles themselves are beautifully animated and major credits to the team behind the game given how they made this top-down view of things become rather compelling. I wish that you had more control over the fleet as the events unfold. The game is a little light on tutorials and it's not truly clear how the different percentage priority sliders work and you'll have a lot of trial and error you go through in order to find a method that works. The different stages will each require new techniques and you'll end each stage not quite certain why you survived - if at all. The game even provides weird statistics at the end of each match to show which weapons were most effective or which ship designs proved most effective. Despite the option to build fighters, frigates and cruisers, I largely found a variety of specialized cruisers to be more effective. One could try to limit one's fleet in order to maximize the potential honor rewards for added variety, but I have to admit I'm not quite at that level of comfort yet. The game feels a lot like the space design and fleet combat part of the old Master of Orion games, but that's about it. There's a flimsy bit of story somewhat holding things together, but not by much. But that's not the point of the game, as indicated in the very name of the game. Just build your ships, set them loose against the enemy and hope you survive. Gratuitous Space Battles has few ambitions beyond its name but at least it generally fulfills that promise. I just wish it was easier to learn the game instead of relying on trial & error or the internet at large - if you get my drift. So the game rates a good 3.5 cruisers breaking up into pieces out of a possible 5.